Question: Could the largest azhdarchids fly? Tradition says: Yes! Most pterosaur workers say: Yes! Flying azhdarchid models say: Yes! We looked at that question earlier and came to another conclusion based on comparable vestigial wingtip phalanges in flightless pterosaurs. Today there’s more to consider. this time comparing the largest flying bird to the largest flying pterosaurs, and the largest non-flying bird to a giant pterosaur (Fig. 1). Since the largest flying birds and pterosaurs had the longest wing/neck and wing/torso ratios, the reduction of wing span/neck length points toward flightlessness—if analogous. lacking the ability to fly removes the constraints for multiple increases in size. We know of no pterosaurs that had vestigial wings, only vestigial distal wing phalanges. Three of the four flightless pterosaurs we looked at earlier were pterodactyloid-grade quadrupeds, so their free fingers had to contact the substrate. Moreover, all flightless pterosaurs could still flap vigorously, whether to ward off threats by display and/or increase thrust while fleeing. Figure 1. Click to enlarge. The largest flying and non-flying birds and pterosaurs to scale. Are large soaring birds analogs to large flying pterosaurs. If so, then are large non-flying birds analogs to large non-flying pterosaurs. Does giving up flight enable giantism in birds and pterosaurs? between the largest pterosaurs and birds, which are more alike? we have pterosaurs and birds with shorter necks, shorter legs and longer wings. we have a pterosaur and a bird with a longer neck, longer legs and a relatively shorter wing (compared to those of volant pterosaurs). Is it really as simple as that? Or did I cherry-pick taxa? Figure 2. Azhdarchids are stork-like waders, so Ciconia, the stork, is a good analog. It is notably smaller than the smallest known Quetzalcoatlus, about the size of flying azhdarchids. Azhdarchids are often compared to storks. And they do have similar proportions (Fig. 2). But all storks fly and some of the largest (e.g. Ciconia) are only half as tall as the smallest Quetzalcoatlus sp. We know of no giant storks. Even so, at half as tall, the legs of Ciconia were equal in length to the larger Q. sp, the torso was similar in size, and the neck and skull were only half as long. All this would appear to make azhdarchids top heavy relative to the volant stork (Fig. 3), despite a longer wing span, even with reduced distal elements. Figure 3. Q. northropi and Q. sp. compared to Ciconia, the stork, and Pelagornis, the extinct albatross/gannet, to scale. That long neck and large skull of Quetzalcoatlus would appear to make it top heavy relative to the volant stork and gannet, despite the longer wingspan compared to the stork. Pteranodon and other flying pterosaurs do not have such a large skull at the end of such a long neck (Fig. 1). The longer wings of Pelagornis show what is typical for a giant volant wide-ranging tetrapod, and Q. sp. comes up short in comparison. Compared to the stork, Q sp. had longer wings. Compared to albatrosses and pterosaurs, Q. sp. had shorter wings. In any case, that long neck is strikingly different in azhdarchids. Such a long lever arm had to affect the center of balance (Fig 3 red line). Figure 4. Quetzalcoatlus model ornithopter by Paul Macready getting walked to its take-off point. The wing chord extends to the posterior pelvis, which is invalid. The demonstrated wing chord is shown in figure 3. What about that mechanical flying Q. sp? Paul Macready built and flew a gliding Q. sp., (Fig. 4) not a Q. northropi. It did not have a long enough neck or large enough skull. As it was, it was well-engineered and all the mechanics in the torso were unlikely duplicated in the Late Cretaceous taxon. Figure 5. The Macready flying model compared to Q. sp. Perhaps it has always been overlooked that the neck proportions were changed and heavy mechanical motors and batteries filled the torso. The hind limbs are unnaturally tucked in in the model, following Kevin Padian’s invalidated view that pterosaurs were close to dinosaurs. If large soaring birds are analogs to large flying pterosaurs, then are the largest non-flying birds analogs to the largest pterosaurs? Does giving up flight enable and promote gigantism in birds AND pterosaurs? At present, the evidence says: yes. However, it’s not that giant pterosaurs were “too big to fly”. Here’s the working hypothesis: Smaller pterosaurs that stopped flying were then able to grow much bigger, with less constraint for maintaining a center of balance at the shoulders. Figure 6. Quetzalcoatlus running like a lizard prior to takeoff. Leaning forward while running fast is what humans do to. Perhaps the neck was held more erect, like an ostrich or giraffe, back in the Late Cretaceous. to put large pterosaurs and birds together. This should have been posted years ago. linked a MarkWitton.com blogspot.com post titled, “Why we think giant pterosaurs could fly.” It’s worthwhile looking (once again) at the arguments Dr. Witton most recently put forth to test them against the evidence presented by pterosaurs here at PterosaurHereseies. After all, it’s not fair to dredge up arguments Dr. Witton may have long ago abandoned. Alas, Dr. Witton is holding fast to his old arguments and pet hypotheses, many of which paint a false picture of pterosaur biology and behavior, based on evidence to the contrary (see below). with the admission that, “Giant azhdarchids are invariably known from scant remains, sometimes a handful of fragments representing bones from across the skeleton or, in the case of Quetzalcoatlus northropi, an incomplete left wing.” We looked at Q. northropi wing elements earlier here (Fig. 1). They are indeed scant, but nevertheless, impressive. Figure 1. Quetzalcoatlus specimens to scale. Q. sp. is also enlarged to the humerus length of Q. northropi. Gray zones are hypothetical and/or restored. Reduction of the wing, even in the smaller species, argues against flight in giant azhdarchid pterosaurs, as it does in much smaller flightless pterosaurs. Dr. Witton does not acknowledge the presence of any flightless pterosaurs (taxon exclusion). Flightless pterosaurs could test Dr. Witton’s ‘dp crest clear correlate’ hypothesis. Three flightless pterosaurs have been reported here based on their relatively short wings: SoS2428, PIN 2585-4, and Alcione (Fig. 2). Notably, all three have an unreduced deltopectoral crest. Figure 2. Flightless pterosaurs, SOS24248, PIN2584-4, and Alcione, to scale. Reducing the span of the wing is the easiest and most common way to become flightless in pterosaurs. provides the best argument for flightlessness in the case of SoS2428 (Fig. 3), itself a pre-azhdarchid. The same argument works for the other two flightless pterosaurs when comparisons to flighted sisters are presented. Figure 3. Lateral, ventral and dorsal views of SoS 2428 alongside No. 42, a volant sister taxon. In dorsal view it becomes very apparent which one would be flightless. Figure 4. Arthurdactylus in dorsal view. Note the rather small deltopectoral crest in this taxon. that hatchling pterosaurs had adult proportions. They were able to fly shortly after hatching. This also means that small to tiny pterosaurs had wing/body ratios comparable to those of the largest incontrovertibly flying pterosaurs, the ornithocheirids (Fig. 4) and pteranodontids. Notably, the deltopectoral crest of the ornithocheirid, Arthurdactylus, is relatively smaller than one would predict using Witton’s hypothesis, and quite variable in other members of this clade. Dr. Witton does not consider the possibility that large azhdarchids could have employed wing thrust to hasten their getaways on the ground, like many large birds do (Fig. 5). Figure 5. Quetzalcoatlus running like a lizard prior to takeoff. Click to animate. used software designed to model bird flight to predict that giant azhdarchids could fly faster than 90 kph and were easily able to sustain long distance glides. and provided a helpful illustration (Fig. 6) to show the moment of takeoff. Remember, in pterosaurs the wing finger never makes an imprint, so the three tiny free fingers must bear some multiple of the entire weight of the pterosaur at the moment of lift-off, then the ventrally-oriented wing finger must circle around to provide at least one upward lift and one downward flap before the otherwise inevitable crash. Not even a heavily muscled kangaroo can lift itself to such a height on the first leap. Not even a body builder can perform such a push-up… but a tiny vampire bat can, and does so routinely. Figure 6. In the ‘quad launch’ hypothesis, for which there is currently no fossil imprint evidence, the pterosaur does a sort of leaping push-up using its tiny free fingers to bear some multiple of its entire weight during the acceleration, without flapping, to takeoff speed. Then the dangerous part begins. The pterosaur has to swing its wings up and down to creat aerial thrust before crashing (see figs. 7, 8). The short humerus provides little leverage to do this. Among tetrapods, only tiny highly derived bats are able to succeed with this sort of takeoff scenario. All other pterosaurs flap first, then fly. if pterosaurs don’t make altitude every time they attempt a launch? (Fig. 7) Calamity (Fig. 8). There is no room for error, no evolutionary path to perfection, even if possible. Can one enhanced pushup provide the necessary airspeed and altitude without wing assistance? Witton and Habib think so? Look what those giant wings have to do before contributing to thrust and lift. Much better to get those wing providing thrust and lift at the moment of takeoff, rather than waiting until, perhaps, too late. Figure 7. Successful Pteranodon wing launch based on work by Habib (2008). Best case scenario. Figure 8. Unsuccessul Pteranodon wing launch based on Habib (2008) in which the initial propulsion was not enough to permit wing unfolding and the first downstroke. Figure 9. Successful heretical bird-style Pteranodon wing launch in which the hind limbs produce far less initial thrust because the first downstroke of the already upraised wing provides the necessary thrust for takeoff in the manner of birds. This assumes a standing start and not a running start in the manner of lizards. Note three wing beats take place in the same space and time that only one wing beat takes place in the Habib/Molnar model. Figure 10 Standing Pteranodon (the Triebold specimen). Note the robust and extended pelvis supported by at least nine sacrals. 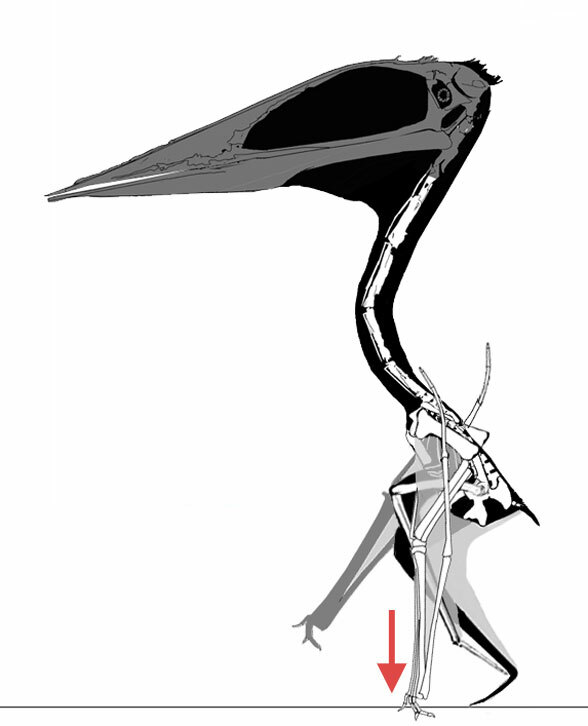 of pterosaurs, but in all cases, the pelvis is also enhanced (Fig. 10) with fused sacrals, prepubes and an anteriorly expanded ilium anchoring powerful, and under appreciated muscles. Ignoring evidence that does not serve a pet hypothesis. “the most efficient launch mechanism conceivable for a tetrapod,” ideal for such a strong humerus and such a weak femur. Julia Molnar produced a video of a quad launch. You might remember that the Molnar pterosaur free fingers were incorrectly reduced (Fig. 11) and relocated to the dorsal (in flight) surface of the wing in order to get that big wing finger on the ground and ready to snap like a grasshopper’s hind limb. Yes, they cheated the anatomy to make their pet hypothesis work… and Dr. Witton warmly embraced, rather than pointing out its faults. Figure 11a. Left: The so-called catapult mechanism in pterosaurs. The fingers are in the wrong place and cheated small in order to let the wing finger make contact with the substrate – which never happens according to hundreds of pterosaur tracks. Right. The actual design of pterosaur (in this case Anhanguera/Santandactylus) fingers. Click to enlarge. (click to play YouTube video) apparently assumes a nearly weightless mass, a super powerful pushup, and a suspension of the moment of inertia required to drag that big pool stick of a wing finger around to the flying position after it has just been oriented ventrally to say nothing about the effects of drag while opening that less than aerodynamic wing membrane. Isn’t it better to completely extend that wing and set it in the upward position before launch? The quad launch is dangerous for its participant every time they perform it. Much better to generate wing thrust at the moment of takeoff, not some time later. Such takeoffs can be aborted or diverted without the danger of a crash landing. The quad launch hypothesis works well for small bats, ankle high to a Dimorphodon (Fig. 12), which fly in a different fashion from other volant tetrapods, but this ability does not scale up well for giraffe-sized or other pterosaurs. Dr. Witton cherry-picks the data that fits his hypotheses and ignores data that invalidates the last few years of his work. Given the paucity of data at present for giant azhdarchids, it would have been appropriate to restore Q. northropi as flightless AND volant, and tell us where the dividing line would be if the missing bones were one way or the other, making comparisons to smaller azhdarchids and to other fully volant large pterosaurs, like ornithocheirids and pteranodontids. It would have been professional and appropriate for Dr. Witton to alert us to the (perhaps inadvertent) cheating Molnar and Habib did to their pterosaur manus (Fig. 11) before some rank amateur brought it to our attention, and not to adopt this bogus and untenable idea with such gusto (Fig. 6), perhaps out of friendship. Figure 12. Dimorphodon and Desmodus (the vampire bat) compared in size. It’s more difficult for larger, heavier creatures to leap, as the mass increases by the cube of the height. Size matters. Note the toes fall directly beneath the center of balance, the shoulder glenoid, on this pterosaur, And it would have been awkward to get down on all fours, especially with giant finger claws. At what stage(s) did azhdarchids lose the ability to fly? If we just look at wing length (reduction of distal elements) then this clade appears to have become flightless at least twice (Fig. 13). In both instances that happens when the wing finger tip is no higher (when folded) than the dorsal rim of the dorsal vertebrae. And that happens the second time when azhdarchids double in size to standing over a meter tall. If valid, then the doubling and doubling in size of azhdarchids was possible because they gave up aerial pursuits in favor of a fully terrestrial and/or wading niche, as in the many giant flightless birds we are more familiar with. Figure 13. Click to enlarge. Here’s the 6 foot 1 inch former President of the USA alongside several azhdarchids and their predecessors. Most were knee high. The earliest examples were cuff high. The tallest was twice as tall as our former President. The doubling and doubling again in size was made possible by giving up the constraints of flying. Habib MB 2008. Comparative evidence for quadrupedal launch in pterosaurs. Zitteliana, 159-166. Witton MP and Habib MB 2010. On the size and flight diversity of giant pterosaurs, the use of birds as pterosaur analogues and comments on pterosaur flightlessness. PloS one, 5(11), e13982. Figure 1. 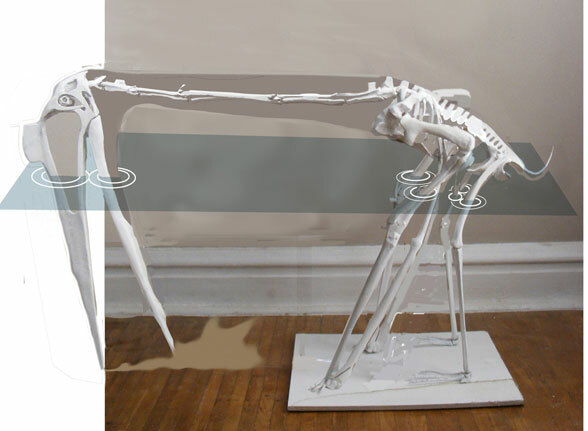 GIF animation (2 frames) showing the original and repaired versions of this Quetzalcoatlus statue and its artisans. Pterosaur wings folded to near invisibility when folded as shown by manipulating bones and observing fossils. Only a narrow chord wing membrane, as in figure 2, works here. Note the unwarranted wrinkles in the original wing membrane. Note in the original the trailing edge of the wing membrane is directed to mid-metacarpal, rather than to the 180º metacarpophalangeal joint as in the repaired version, fossils and other illustrations below. And what is going on with those tiny anterior pteroids? That is wrong, so wrong. artists and filmmakers have struggled to portray pterosaur wing membrane when the wings are folded and the pterosaur is walking around (Figs. 1, 3–5). Fossils (Fig. 2) that show how the wings looked when folded are too often ignored. Figure 2. Here’s how the wing membrane in pterosaurs virtually disappeared when folded. This is CM 11426 (no. 44 in the Wellnhofer 1970 catalog), Note: the left wing has been axially rotated during taphoonmy such that the folded portion of the membrane was fossilized posterior to the bony spar. (Fig. 2) shows how wing membranes fold down whenever the wing bones are flexed (folded). Like bats, pterosaur wing membranes fold away to near invisibility. If you think CM11426 looks a bit like Quetzalcoatlus, you’re right! It’s in the lineage in the large pterosaur tree (LPT), but it’s not larger than a typical Pterodactylus (Fig. 9). Stan Winston’s Pteranodon (Fig. 3) had saggy, baggy wing membranes. So did early paintings by Burian (Fig. 4). These clearly do not reflect what happens in fossils and in life. Figure 4. Artist Z. Burian also struggled to realistically portray the folded wing membrane in pterosaurs forgetting the fossils and the fact that both birds and bats have no trouble folding their wings without wrinkling them. artists freehand their pterosaurs (Fig 5 purple), ignoring the bone and soft tissue evidence. Figure 4. Two of the most completely known Pteranodon (UALVP24238 and NMC4138) along with the skull of KUVP2212 to scale. In purple, John Conway’s Pteranodon (purple) with a much smaller skull and an inappropriate elbow-high walking configuration. Figure 5. Toy Pteranodon, ca. 1962, from the Marx Company. also suffer from deep chord wing membranes (Fig. 5). Proportions here are wildly inaccurate for the toddler set. Accuracy is also absent in many professional reconstructions that include skeletons (Fig. 4), so there is enough blame to go around. The fossils (Fig. 6) document how the artists and sculptors should present those folded wing membranes. Too few artists and sculptors who claim accuracy are actually producing accuracy. Figure 6. The plate and counter plate of the BSP AS V 29a/b specimen of Pterodactylus with color overlays of the bones and visible soft tissues. What do you get when you choose accuracy? A much less monstrous awkward portrayal and a much more elegant bird-like/bat-like portrayal comes from keeping true to the bones and soft tissues as they are. Deep chord wing membranes that attach to pterosaur ankles are as outdated as tail-dragging dinosaur portrayals. And while we’re at it, keep those pteroids pointing inward, forming straight leading edges for the distal propatagia. Figure 7. Pterodactylus walking. Note the foot will never plant itself in front of the hand here. And why are both hands on the ground at the same time as the back foot? Hmm. This animation frame (Fig. 7) from a walking pterosaur movie associated with the Crayssac tracks accurately portrays the wing membrane essentially invisible when folded. Artist unknown. Another animation matched to Crayssac tracks (Fig. 8) does not include wing membranes, but they would have been nearly invisible here. This version shows a more upright quadrupedal stance, as if the pterosaur wings were used like ski poles. As noted earlier, this is essentially a bipedal pose, enabling wing opening and flapping without shifting the center of balance. Go with the evidence, not traditional and sometimes current renderings. Follow the evidence. Figure 9. The Vienna Pterodactylus. Wing membranes in situ (when folded) then animated to extend them. There is no shrinkage here or in ANY pterosaur wing membrane. That is only an “explanation” to avoid dealing with the hard evidence here and elsewhere. and its flying abilities, it is worthwhile to take another look at gracile m4.2 (second wing phalanx) on the giant Q. northropi vs. the same phalanx on the much smaller and more likely volant Q. species (Fig. 10). Sorry I didn’t bring this up during the earlier discussion, on azhdarchid flight, first published online three years ago here, but I forgot I had it, and it’s more damning evidence against giant pterosaur flight. Figure 10. Quetzalcoatlus sp. compared to the large specimen wing, here reduced. I lengthened the unknown metacarpus to match the Q. sp. and other azhdarchid metacarpi. I offer the wing finger has reconstructed by the Langson lab and with filler reduced. Note m4.2 is narrower on the larger specimen, which doesn’t make sense if Q. northropi was volant. Figure 11. Freehand wing planform cartoon for Quetzalcoatlus from Witton and Habib 2010. There is no evidence in any pterosaur for this wing plan. Such deep chord wings cannot help but create unwarranted wrinkles when folded. and the muscles that enabled complete flexion (Fig. 12) were covered earlier here. Figure 12. Pterosaur (Santanadactylus) wing folding. Note when the wing is perpendicular to the metacarpus the flexor must be off axis in order to complete the wing folding process. The insertion must be distal to the joint because the flexor process of m4.1 extends dorsally over the metacarpus during wing folding. Otherwise the ventral (palmar) flexor would be cut off from the swinging dorsal process. describe the post-crania of Quetzalcoatlus (Fig. 1). There are a few confusing comments in this abstract (see below), which I did not edit. I encourage you to translate them yourself as best as you can. Figure 1. Quetzalcoatlus in dorsal view, flight configuration. an engineer, in this case, probably J. Cunningham, wrote it, which is good. The reconstruction at reptileevolution.com (Fig. 1) agrees with this description, including the elevation of the elbows in flight, which is rarely done in illustrations and models. There is no trouble elevating the hind limbs into the plane of the wing with those ball and socket joints at the acetabulum. Quetzalcoatlus is often compared to a small airplane in size. Like all pterosaurs it would have also flown like a small airplane, with horizontal stabilizers. who overextend the elbows and wrists. Padian K, Cunningham JR and Langston WA (RIP) 2015. Post-cranial functional morphology of Quetzalcoatlus (Pterosauria: Azhdarchoidea) Journal of Vertebrate Paleontology abstracts. It’s more than 30 years old. It’s not HD. It still supports the notion of a inverted hanging pterosaur. It precedes the discovery of eggs. Even so, it features a gliding Pteranodon model, lots of great sea bird scenes (including diving pelicans, soaring, dipping frigate birds and skimming skimmers) along with several great bat scenes (including grounded bats taking off). The video also stars a bipedal animated Dimorphodon following the then recent release of Padian’s early work on that pterosaur. Earlier Pterodactylus, a small pterodactylid pterosaur, was animated to match Craysaac tracks (Fig. 1). 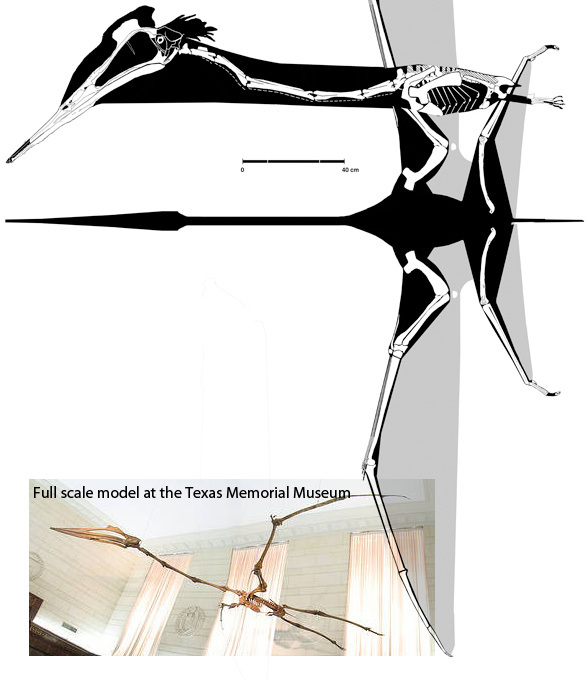 In this model the backbone is elevated higher here than in some of the wireframe pterosaurs you may have seen (Fig. 3) and the forelimbs carry little if any of the weight. Nevertheless, in this species they work like and impress like ski poles — doing the pterosaur walk. Today, Zhejiangopterus (Cai and Wei 1994), a large azhdarchid pterosaurs, is similarly animated to match large Korean pterosaur tracks (Hwang et al. 2002; Fig. 2). Note how Zhejiangopterus carries its head, with the middle ear region above the center of gravity, like a human. At any point Zhejiangopterus could lower its skull for a meal or a drink. It could also raise its wings without shifting its balance to initiate a bipedal takeoff. Note how little the forelimbs actually touch the substrate. Again, this is the ski-pole hypothesis in which the forelimbs are used mainly to steady the pterosaur, not to generate thrust or support the weight (exception noted below). Figure 2. The large azhdarchid pterosaur, Zhejiangppterus. is shown walking over large pterosaur tracks matched to its feet from Korea (CNUPH.p9. Haenamichnus. (Hwang et al. 2002.) The feet are planted just as the hands are lifted. Click to enlarge and animate if not moving. The skull would be far from the center of gravity at the end of a long neck. Bearable, perhaps, in tiny Pterodactylus. unwieldy on giant Zhejiangopterus with its oversized skull. The forelimbs would bear most of the weight with the skull far beyond them. This is fine when floating and poling. Standing up to open the wings for display or flight would involve throwing the skull backward to end up standing bipedally. Awkward. Time consuming. The competing quad launch hypothesis is out of the question as reported earlier here and elsewhere for the reasons listed therein. Figure 3. The horizontal backbone hypothesis for quadrupdal pterosaurs (Mazin et al. 2009). This hypothetical model is supposed to match tracks, but the tracks can be matched to a genus and species, so why not use it? Click to enlarge. Note the massive bending of the wrist here. Completely unnecessary. Mazin et al. (2009) published a series of imagined wireframe pterosaurs matched to the tracks (Fig 3). This is odd because a former champion of bipedal pterosaurs was co-author Kevin Padian, who was a quad ptero-track denier for many years until the Craysaac tracks won him over (while continuing to deny the pterosaur nature of other tracks. Odder still because the animation that was used for the public (which I saw year ago and not sure if it is still in use, but is not used here) showed a more upright Pterodactylus. Note: The published wire frame model might match the gait and placement of the ptero tracks, but the manus and pes of the wireframe model are but a small fraction of the size of the tracks. This is something the authors and their referees missed, or overlooked. But we all know, the devil is in the details. “If the glove doesn’t fit, you must acquit.” — Johnny Cochran at the OJ Simpson murder trial. you’ve got the wrong wire frame pterosaur model. Contra Mazin et al., I took the effort to match the manus and pes track to an extinct taxon. In Science, you must use the data as precisely as you can, and let those data tell you, as closely as possible, how to build your model. Don’t walk in with your pet hypothesis and try to shoehorn or BS your way through it, unless you can get away with it, as Mazin et al. did until now. Figure 4. Zhejiangopterus at a stage in its walking cycle in which the right manus bears nearly all the weight. M. Habib noted the arm bones were much stronger than they needed to be for flight. Well, maybe that’s because Zhejiangopterus was walking on its forelimbs. Birds don’t do that. BTW that’s the same force vector Habib imagined for his ill-fated quad takeoff. I hate to say it, but this pose makes more sense in every way. and I’m sure it has minor flaws that may never be known, then the tiny manus bears nearly the entire weight of the pterosaur at one and only one brief point in the step cycle (Fig. 4) that does not need support in normal bipedal walking. The tiny area of the tiny fingers is likely to impress deeper because the weight of the pterosaur is concentrated on a smaller area (compared to the long foot) in contact with the substrate. This pose also might answer Mike Habib’s original mystery as to why the pterosaur humerus was built stronger than it needed to be for flight. Birds don’t put their weight on the forelimbs. And few bats do (the tiny vampire is the exception). for pterosaur quadrupedal standing (Fig. 5) for ready comparison. Which of these provides a bended knee with the proper vectors for thrust? The manus doesn’t have to and didn’t provide thrust, but it should not have been placed so far forward that it could only provide a braking vector to the shoulder. Figure 5. Click to enlarge. 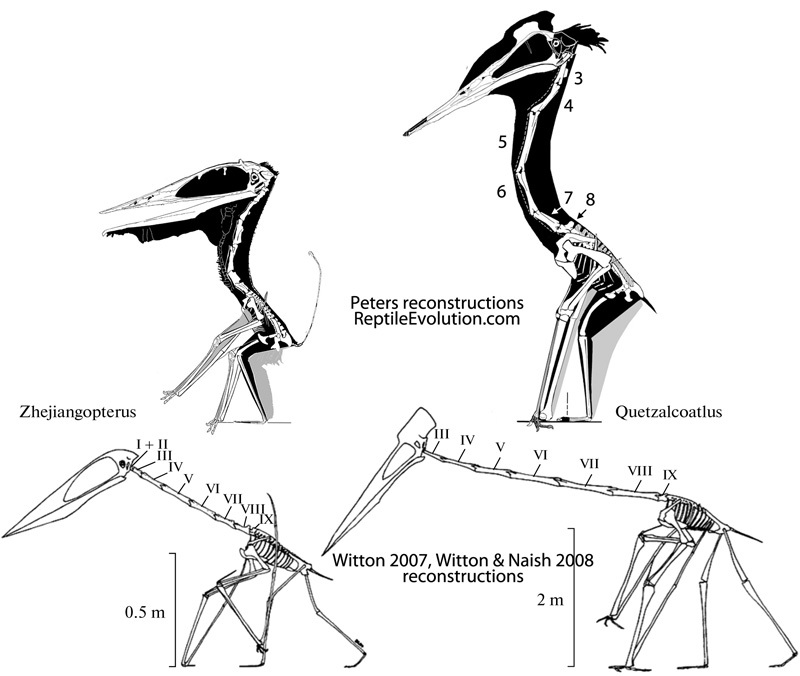 Averinov re-published images of Zhejiangopterus and Quetzalcoatlus from Witton 2007 and Wittion and Naish 2008 that demonstrate a certain devil-may-care attitude toward the anatomy, especially in Quetzalcoatlus. Moreover, just imagine the long lever problems these two have with that long extended neck while walking and the tremendous strain put on that forelimb, which is not angled correctly to provide thrust. It don’t provide thrust in the more upright pose either, but it doesn’t need to. In that case it merely provides some stability. On the other hand, a feeding pterosaur in water might have looked something like this (Fig. 6). Figure 6. Quetzalcoatlus scraping bottom while standing in shallow water. Here the hollow and airy skull is nearly weightless or even buoyant in water. Hwang K-G, Huh M, Lockley MG, Unwin DM and Wright JL 2002. New pterosaur tracks (Pteraichnidae) from the Late Cretaceous Uhangri Formation, southwestern Korea. Geology Magazine 139(4): 421-435. Mazin J-M, Jean-Paul Billon-Bruyat J-P and Padian K 2009. First record of a pterosaur landing trackway. Proceedings of The Royal Society 276:3881–3886.